It is more than four days but I am still undecided on what to call Manmohan Singh’s farewell media conference. Someone who was more or less shoved down our throats as the priminister of this great nation 10 years back was up there on top of the dais, reading from a bunch of papers for his so called final interaction. And what he did when he was at it is nonchalantly mocking everything and everyone, including our whole democratic process. The best our PM offered that fateful but highly regrettable day was dishonesty, evasive agendas, avalanche of inadequacies, ship loads of hypocrisy, uncountable number of lies, unmatched and unbelievable shamelessness and last but not the least, with all probability a lot of sycophancy that is so trademark to Congress and every Congressi. Among others a great and perhaps one of the biggest qualities of a leader is the way he/she communicates with others. While the chips are down, a strong and committal statement of a true leader works wonders in the long run. You can pick up any history book and it will throw at you numerous examples on how true leaders always carried themselves. Do you consider Manmohan Singh as a leader on those parameters? By any stretch of imagination? Whenever Dr. Singh opened his mouth he only showcased how uninspiring a person he is. To top it, he always had this bad habit of downgrading the national moral with each syllable of his utterances. He always frolic the game of ‘playing Ostrich’ with each of his statements and pretty much lived up to his reputation of being an evasive leader with his last public address as well. Though, his last interaction with the media has got nothing to write home about, it still asks for some short of analysis since, we as a nation were expecting Dr. Singh to elaborate his unfortunate tenure of 10 years as the priminister of world’s largest democracy. Let’s see how Dr. Singh faired with his own assessments of his own government’s achievements or the acute lack of it. People know why AAP got the kind of rise they got. Riding on a single agenda horse called corruption, a party literally rises from the ground to the power circles of Delhi. If one marks the corruption acts that AAP always basket upon were the ones carried out by the Manmohan Singh government. But did our priminister touch base on any of those mega scams which he, by choice or compulsion presided over? Not a single line came from our PM till the point one of the jurnos from Times Now asked precisely on those lines. And what we got for a reply from Dr. Singh? I would consider calling Dr. Singh’s reply as shocking, a gross understatement. I don’t know of any other country where a democratically elected state head would so nonchalantly brush off his or his government’s corrupt acts by citing his party’s electoral success. Since people did a mistake of electing the same corrupt lot in 2009, Dr. Singh shamelessly finds the same as a proof of his government’s holiness. Could you believe, a state head explains how looting the nation by both hands shouldn’t be discussed at all since he still managed to win elections after those mega loots? As if the dishonesty towards the nation and people who elected them for the first term were not enough, our priminister was too barefaced to display his party's collective and his own dishonesty at such ease. In one go Dr. Singh not only justified the massive scams but also justified why he or his government shouldn’t be questioned for such mega hara-kiri. My tweet is the reflection of my frustration in even imagining how we managed to reelect such a dishonest man to head our nation. Someone who doesn’t have the courage to accept his own fault lines is unfortunately our so called leader for last 10 years. First of all – shame on us voters for inviting such national level causalities to our political discourse. 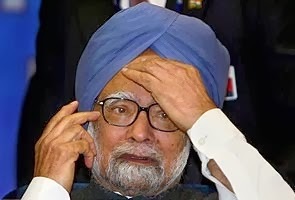 If you think Dr. Singh reached the lowest point of anything that we normally associate with a leader then just hang-on. There are more spectacles to come. Before moving on to Dr. Singh’s next blabber lets analyze the background a bit. During the entire tenure of UPA one and two, we had this parallel propaganda of lie peddling and nefarious agenda went around a person called Narendra Modi. It is a different thing that all the liars had to eat crow at the end since all courts, SIT included, gave clean chits to Modi on Gujarat riots. But does that stop the secularists to keep on sailing on their path of untruth and deplorable actions? And Manmohon Singh heads the congregation which has long certified itself as the flag bearer of secularism in the entire Milky Way. So when asked about Narendra Modi, Manmohan Singh was expected to reply again on the lines of some high grade shamelessness. Doesn’t matter if the courts have an entirely different perspective about Modi vis-à-vis the Gujarat riots. Doesn’t matter if in the process our priminister questions the wisdom of our courts so openly. What matters are the vested interest and the subsequent personal benefits that come along with it. It is even funnier coming from someone who could possibly be the biggest disaster the nation has seen in its entire history. Though Dr. Singh isn’t aware how big a disaster he himself is, he very well knows who else could be a disaster for the nation. While, the nation can cope with any kind of disaster post the 10 year long onslaught of the mega disasters called UPA and Manmohan Singh, Dr. Singh finds it worth pointing at the non-existent threats. What would you call such oratory which at best can be termed as nonsense in milder terms? For the first time in my writing life, I am finding it really tough to pick a word to fit best. I guess ‘moronic’ gets the closest to the word I am looking for. While Dr. Singh finds Modi a disaster for the nation, whom he finds the best thing that can ever happen to India? Ohh, yes; absolutely no points for guessing that genius according to Manmohan Singh. While NaMo is a disaster, Rahul Gandhi scores heavily on the scale of potentials according to Dr. Singh since he finds Rahul Gandhi to possess “OUTSTANDING” qualities to become the PM of this nation. I had never heard such blatant miscarriage of the word “OUTSTANDING”. Last time I heard someone literally massacring this heavy word was when he cited how an outstanding actor Shahrukh Khan is. That is like saying – ‘There is no corruption in India; Delhi is the safest place for women; Our media is not sold out outlets; Rahul Gandhi has outstanding qualities to become the PM and Pigs can fly’, in one sentence. Kudos to Dr. Singh for stooping to yet another low as if all his previous lows were not enough for all of us to hang our heads in shame. I mean, this single sentence liaised with so much sycophancy and absurdity that it took me good fifteen minutes to convince myself to believe that the nonsense came directly from our priminister. More than the absurdity my mind was crying out for Dr. Singh to at least cite one quality from the zillion of outstanding qualities he saw in Rahul Gandhi. Only a single quality would have sufficed my urge but usual to his habit of disappointing the nation, Dr. Singh yet again disappointed with none. That said, wasn’t the spectacle worth recording and preserving for future generation’s reference. I mean you rarely see two biggest of disasters engaged in mutual admiration and scratching each other’s back with praise. I even don’t want to elaborate what Dr. Singh finds as his achievements as the priminister. Indo-US nuclear deal he said; didn’t he? That very answer cuts a sorry picture. While at the juncture of completing his second tenure, Dr. Singh only finds something he did during his first tenure as his achievement. That literally means he didn’t manage to achieve anything during this corrupt ridden second tenure. And we were forced to accept this spineless and uninspiring entity as our PM and that too for a decade. I will get a brain hemorrhage if I don’t stop right away. Disparaging seems such a light word now. Spot on as always. Shameless party with a shameless to head it. What else can be expected except outright jokes? The more I think about it, the more I am shameful of our nation to elect such a PM. You clearly are a hardliner aren't you. And for the record, and not that this changes anything, UPA 2 was a failure. If UPA 1 was a failure, you'd be calling Indians stupid for having elected them again right? The PM was not elected at all. HE was and probably is a member of the Rajya Sabha. India needs to elect her Premier directly rather than the MPs of the largest party electing him/her. Only then can the people have a say in the choice of the PM. People voted foolishly as there was fractured mandate and it was the very much Us tilted media that created all aura in young generation that it will help them for their business. Its the national shame when a prime minister of a democratic country fails to speaks truth. Moreover, how has he be allowed to use national official stage for political speech !! Yes my friend we indians are stupid lot otherwise congress would not have ruled most of the years after independence..
APP to AAP-Con Mutation rom APP to AAP-Con. So,I am assuming you have something called 'nationalist' certificate issued by the govt ?. What makes you so dockside that others who don't toe your line are anti nationals? Look at the votes polled from 1999..congress always has over 20% votes..from past two elections,over 30%. So,effectively all those who voted for upa are anti national ? A rational and factual discussion makes sense. Generalization and name calling just exposes the fact of the intelligence and credibility of the person. Need not justify for 'Conscious Ineptness' morons. Not sure if you have stepped out in the rural hinterland..given that you don't have the exposure,maybe try watching youtube videos of chamars and jat rap songs..
Caste is a reality in india..a dark reality at that. Not a media creation. Also,smacks of typical high caste 're are all Hindus' line..Hinduism is an amalgamation of practices and rituals. Really difficult to find a common thread. Stop living the false we are all Hindus and hence need to be united pipedream. Cannot happen because of ground realities. Why do you think so many lower castes vote for congress ?.because the Bjp is perceived as a party skewed to high castes..the representation of backward and lower castes is much lesser than others.